Jonathan's Blog: Curse God or Trust God? Curse God or Trust God? Then his wife said to him, “Do you still hold fast your integrity? Curse God and die.” But he said to her, “You speak as one of the foolish women would speak. Shall we receive good from God, and shall we not receive evil?” (vv. 9-10a). When a Christian suffers, s/he asks, “God, why did you allow this to happen?” The suffering Christian can go from asking that question in faith to asking it in anger. When suffering comes, there’s the temptation to curse God. That’s what Satan wanted Job to do. That’s what Job’s wife said he should do. “Stretch out your hand and touch all that he has, and he will curse you to your face” (1:11). “Stretch out your hand and touch his bone and his flesh, and he will curse you to your face” (2:4). “Do you still hold fast your integrity? Curse God and die” (2:9). Job’s suffering was great: “Oh that my vexation were weighed, and all my calamity laid in the balances! For then it would be heavier than the sand of the sea” (6:2-3). To curse God would have been the normal response for Job, but it would have been a foolish (i.e., short-sighted) response. God is able to take something very bad and use it to do something very good. God did this with the cross. Peter said to the people of Jerusalem: “This Jesus, delivered up according to the definite plan and foreknowledge of God, you crucified and killed by the hands of lawless men” (Acts 2:23). The cross was something very bad, but he used it to do something very good: save us. The crucifixion of Jesus was the worst thing that ever happened, but it was also the best thing that ever happened. How can something good come out of our suffering? Did something good come out of Job’s suffering? James writes, “You have heard of the steadfastness of Job” (James 5:11). If Job hadn’t suffered, he wouldn’t have been remembered. 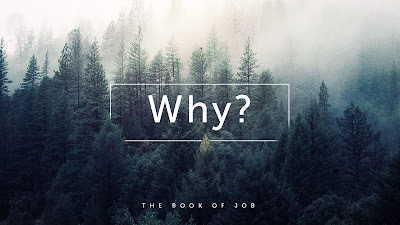 (Just the other day a TV hockey announcer describe a player as having “the patience of Job.”) Job’s faithfulness to God in the midst of suffering has inspired countless people through the centuries. When we suffer, we have the opportunity to show people that the gospel really does change lives. When life falls apart, why shouldn’t we curse God? First, we shouldn’t curse God because we have proof that he loves us (i.e., the cross). Second, we shouldn’t curse God because God is able to take something very bad and use it to do something very good (e.g., the cross).